The Intersections & Beyond: If DLSU wins in the UAAP Games on July 7, Mochiko throws a surprise! 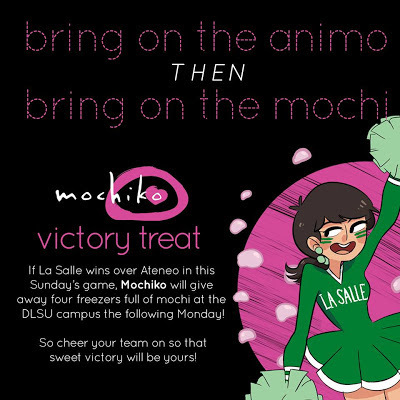 If DLSU wins in the UAAP Games on July 7, Mochiko throws a surprise! De La Salle University will have its second game in the UAAP Games on July 7, 2013 at 3:30pm at the SM MOA Arena. This time against rival Ateneo de Manila University. Let's cheer and support La Salle. If La Salle wins in the game, Mochiko will give away four (4) freezers of mochi to DLSU and set it up inside the campus the following Monday, July 8. Let's hope for the best!